In an era of unprecedented change, technology offers banking clients greater access to information than ever before. Out of this revolutionary advance, a new class of smarter and more demanding customers has emerged. In tandem, new financial players are moving quickly to offer new compelling digital services. As with every major change triggered by technological advancement, there are clear winners and those who are unable to adapt. 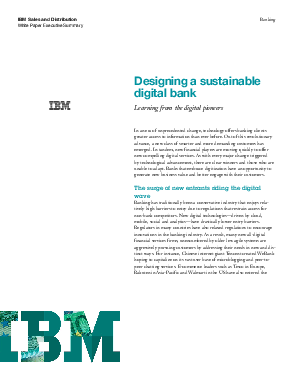 Banks that embrace digitization have an opportunity to generate new business value and better engage with their customers.